Jennifer Castles witnessed the incomprehensible damage caused by unjust Australian laws through her sister's lifelong friendship with Mandy Brown. Margaret Castles, a white middle class girl struggled to remain close with Mandy who was aboriginal, despite laws from the early 1900s that tried to force them apart. The struggle these girls faced was seared into Jennifer's consciousness. This book that celebrates the 50th anniversary of the vote to accept indigenous Australians as citizens of Australia, is the result. Although the publishers recommend it for children above the age of seven, I believe preschoolers will easily grasp the powerful message within each startling page. Paul Seden's illustrations highlight more deeply than words that there is little difference between two growing girls. 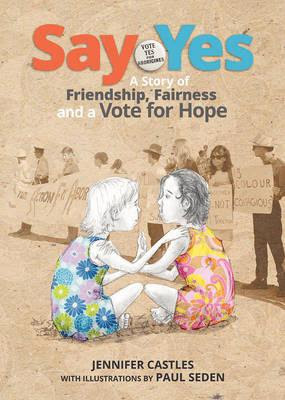 Say Yes is a testament to friendship and the will of a nation to right a wrong that should never have been made law. I believe Say Yes deserves a place in every classroom and every school library. Its gentle rhythmic phrases could easily be the lyrics to a song: preferably one that seeps into our hearts and reminds us never to walk the path of such senseless prejudice, ever again.